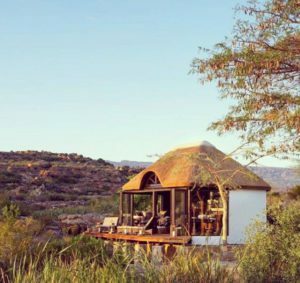 After a three-hour drive from Cape Town we arrive at Bushmans Kloof Wilderness Reserve and Wellness Retreat – a South African National Heritage Site in the lap of the magnificent Cederberg Mountains. With its wide-open spaces interrupted only by exquisite sandstone monoliths and indigenous flora and fauna, this five-star Relais & Chateaux retreat is a communal play place for the human spirit and Mother Nature. The main lodge sits in a lush garden overlooking rock pools and towering cliffs with rock formations which magically change colour with the time of day. We follow the pebbled pathway to our room – one of 16 units which include a honeymoon suite. Very spacious, it features a cosy fireplace, marble desk and king-sized bed adorned with the finest linen. A panel of light switches and dimmers allows full control to set the room’s mood just as we like it. Surrounding our luxurious suite is a patio furnished with comfy loungers, and a manicured garden. 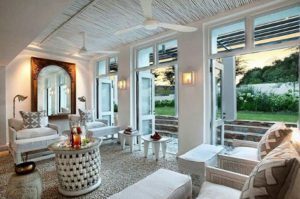 Families or groups of friends looking for more private accommodation on the reserve might prefer Koro Lodge – an old farmhouse converted into a private villa which sleeps eight people. Here you’ll have a dedicated chef, host and guide at your service, plus access to a private swimming pool. But wherever you choose to stay on the reserve, you can’t miss the Relais & Chateaux charm: the small attention to detail, extending from the facilities, food and bedtime titbits, through to the always-on-call personalised service. Wherever possible, the kitchen at Bushmans Kloof uses locally sourced, organic and home-grown ingredients which reflects the eclectic flavours of the Cape Floral Region. 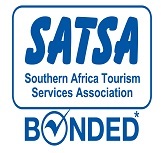 Dinner brings a choice between à la carte, with a variety of South African dishes (including lots of game) or the chef’s specially designed three-course set menu. Having tried both options on different nights, we could only conclude they are both equally delicious! 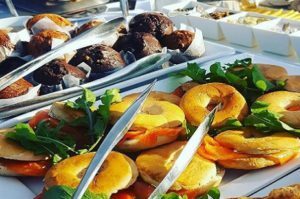 Breakfast is also a treat – we enjoy fresh fruit, pastries and however-you-like-them eggs at the Makana restaurant overlooking the glass-like dam of ducks and lilies. Then it’s onto lunch: a cold beef ciabatta with red onion marmalade appreciated on the Homestead’s terrace. We ease into dinner with early drinks at the River Boma around a crackling fire before we make ourselves comfortable in the Homestead’s dining room for yet another gastronomical affair. So what else is there to do on the reserve besides sit around and eat great food, you may ask? 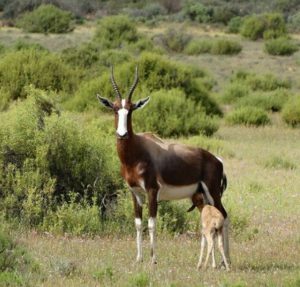 The ecology of Bushmans Kloof is incredibly diverse. 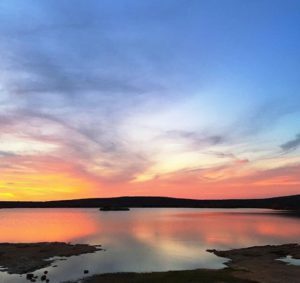 It’s home to 35 mammals, 150 birds and 755 indigenous plant species, which includes the reserve’s very own ‘Cederberg Seven’ – a unique group of shrubs and trees found nowhere else on Earth. In the crisp air of dawn we set out on a 4×4 to enjoy Bushmans Kloof’s most unique activity: visiting one of the reserve’s 130 Bushman rock art sites. 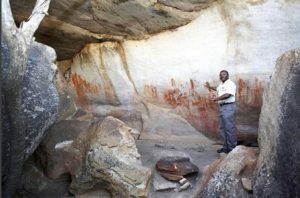 We learn that around 2500 years ago the Bushmen painted pictures of themselves and their surroundings on the sandstone, believing the rock’s surface to be a portal to the divine world of their ancestors. At the Heritage Centre in the Homestead there are displays of Bushman artefacts as well as photographs depicting their hunter-gatherer lifestyle. A late afternoon hike on the 3km mountain trail followed by a dip in the reserve’s heated pool proves a great way to work up an appetite for dinner that evening. Yes, we were eating again. Although we didn’t get round to all of them, other activities on offer include mountain biking, canoeing, swimming, fishing, archery and stargazing through a giant telescope. 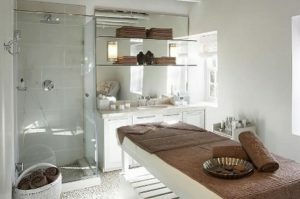 The spa at Bushmans Kloof offers a selection of restoring and rejuvenating treatments, which can all be enjoyed in the comfort of your room, private veranda, or specially designated areas out in the rocky wilderness. 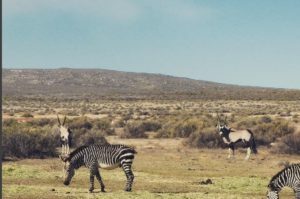 Visit the Bushmans Kloof Wilderness Reserve and Retreat – a South African National Heritage Site in the Cederberg Mountains, 3 hours out of Cape Town.